THE STORY - Willing to bend the rules for her clients, Elizabeth Sloane (Jessica Chastain) remains one of the most sought-after lobbyists in Washington, D.C. When asked to help oppose a bill that imposes regulations on firearms, she instead joins a scrappy boutique firm that represents the backers of the law. Her defiant stance and determination to win now makes her the target of powerful new enemies who threaten her career and the people she cares about. THE GOOD - Jessica Chastain's steely performance. The scripts crackling dialogue. John Madden's pacing. THE BAD - The film's ending may be too preposterous for some to handle with believability. ​“Miss Sloane” is the kind of quick, intelligent and crackling film that you would expect to find from screenwriter Aaron Sorkin. It’s the smartest thing you’re likely to see on the screen before the year is out, it knows it and it's not afraid to show it. Its main character also knows exactly who she is and she is unflinching in how she comes off to others. The character of Elizabeth Sloane is a fascinating one given life by the great Jessica Chastain who turns in her most layered and fascinating portrayal yet as the steely women with little room for compassion towards her enemies or even her friends/colleagues. Taking place in modern day Washington D.C., “Miss Sloane” tells the story of a powerful lobbyist named Elizabeth Sloane (Jessica Chastain) who jumps ship from her powerful firm (Headed by Sam Waterston, with Michael Stuhlbarg leading Sloane’s old team) to a smaller one that is looking to fight against her former employer’s newest client on gun control. Without her trusted assistant Jane (Alison Pill) and working with new team members (Mark Strong & Gugu Mbatha-Raw), Miss Sloane refuses to give up as she is driven by an uncommon desire to win, no matter what the cost. Her track record for success and the history within due to her stubborn mentality unearths itself when Miss Sloane comes under attack from her opponents in the fight to impose harsher gun control laws in Washington. Yes, “Miss Sloan” does have an agenda that leans towards those who want more gun control. However, politics aside, “Miss Sloane” is more of a character piece and a showcase for the ever talented and constantly surprising Jessica Chastain, who has not shown this much fire and passion in a role since “Zero Dark Thirty.” If Maya in that film was a righteous woman hell bent on catching Osama Bin Laden, Miss Sloane is an unmerciful woman who is hell bent on winning. As she states in the film, nothing comes in her way. That drive, motivation and willingness to do whatever it takes to succeed is where “Miss Sloane” gets its energy and its most enjoyable elements from. Screenwriter Jonathan Perera gives Elizabeth Sloane enough character flaws to fill up a book. From her substance addiction due to lack of sleep, to her coldness towards others, to her unethical practices, while some may criticize the character or view her as inhuman, Chastain has enough range in her performance to help us see Miss Sloane from many different angles. Chastain is aided by a strong ensemble that includes Mark Strong, Michael Stuhlbarg, Gugu Mbatha-Raw, Alison Pill, Sam Waterston and John Lithgow amongst others. All of them turn in fantastic work and I’ve said it before and I’ll say it again and always, Stuhlbarg is such an enjoyable character actor that I really wish he would take on more leading roles. The man has such charisma every time he comes on screen and his scenes where he reacts or squares off directly against Jessica Chastain are some of the film’s best moments. Director John Madden directs this film with a kinetic flair that calls back political thrillers of the past where the stakes feel so high and the drama is always present. 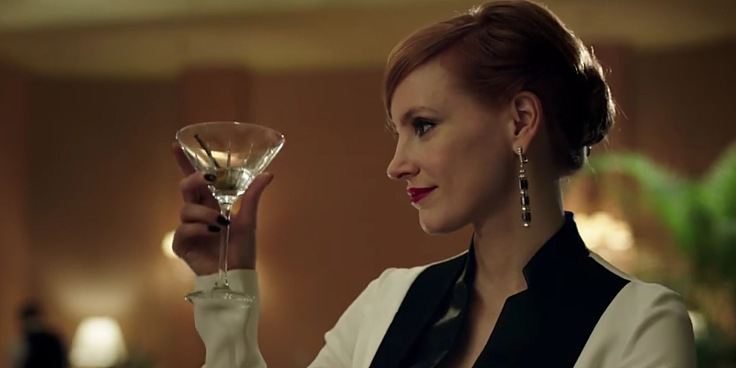 There is not much comedy to be found in Jonathan Perera’s tight screenplay other than a few moments of giddiness when we discover that once again, Miss Sloane is the smartest person in the room and may be the smartest person on the Earth as she is conceived here. As the beautiful piano by composer Max Richter plays over the credits there comes a moment where the audience is left to wonder just how alone Miss Elizabeth Sloane really is. It's another reminder that those who are worried by the film’s lobbying politics need not worry. This is first and foremost, a character drama. One that features one of the best performances of the year and further establishes Jessica Chastain as one of the best actresses working today. The ending to the film may be preposterous, but when the actors playing these characters and spewing this harsh quick-witted dialogue are having this much fun, we can’t help but do so as well.